Thanks for the awesome podcast guys!! Can’t wait to see what’s in store for 2014! Just a suggestion for one of the questions- There is no answer option under “How are you connected to gymnastics” for CURRENT gymnasts like me! Only for former gymnasts! ACK! You are correct. Fixed. You should be able to go back and add that answer. Thank you! Ack! Thanks for telling us. It’s been added. You should be able to go back and pick that. Thank you! You read our minds, we just asked for NCAA routines to discuss on next week’s show. Best Podcast ever! 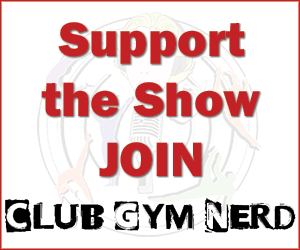 You guys are not only great with the gymnastics information, just plain fun to listen to every week! I wish you had a morning show on the radio so I’d have a podcast every day 😛 Instead I have to listen to the banal chicago radio…oh well! Seriously you guys put such heart and soul in to this and your audio is great, your guests are great…can’t say enough about it! Thanks for all you do!